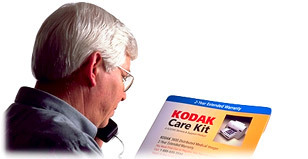 KODAK Care Kit - Buy Kodak Service by the Box! NEW!! Service offerings that deliver service, support, and consumables in one convenient purchase. 1, 2, & 3 year Extended Warranty and Maintenance Agreement Care Kits are available (see listing of products under the "Related To This Product" box at the top of this page). A KODAK Maintenance Agreement will help keep equipment running at peak performance while protecting your budget. 1st Run Computer Services Inc..